Merry Meet! Welcome to the Silver Chalice E-zine! Surrender, Acceptance, and Balance. Perhaps unexpected subjects for a 'zine on Wicca spirituality. Like all spiritual matters, of course, when you peer under the various wrappings, you find the same gift. These are as much a part of Wicca spirituality as anything else. Surrender and Acceptance are perhaps easily seen as related concepts. But how does Balance fit in? Balance is the acceptance of ebb as well as flow. We humans are (perhaps naturally) oriented toward flow. We have a harder time with ebb. But both are necessary to existence. We can surrender and accept balance, and balance helps us accept surrender. They are firmly intertwined. But why should we accept surrender? Why seek balance? Simply because they are part of life, unavoidable even if we try. And the very act of seeking to avoid them leads only to misery. The Wheel of the Year teaches us about accepting the flow and ebb of life. This month we'll look at the meaning of Mabon, the Autumn Equinox... even though it took place last month. Mabon -- Autumn Equinox -- is naturally steeped in balance, as the article shows . . . not only in symbolic meaning, but in astrological positioning. The Energy Field Barometer looks at this process that seems to be stretching our balance to extremes... how far can we go before we snap? A little surrender can make a huge difference, not only for our peace of mind but in practical results as well. And while we're on the subject, this issue of the Silver Chalice was a practice in surrender. You may have noticed that it's a little behind schedule. Well, family obligations arose, and took precedence. I prefer to be dependable, but sometimes we have to go with the flow, even when it's not flowing where we'd like. Nonetheless, I apologize for my tardiness. I wish you the best of the season! Ask The Priestess -- "How Can I Find My Wiccan Name?" Finally! 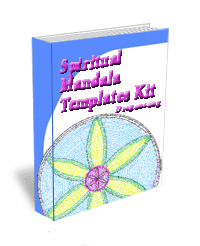 The Personal Mandala Starter Kit is now available. I give up on Paypal and found an excellent company instead, and I'm thrilled to be able to offer you this wonderful resource at last. So why a Mandala Starter Kit? I was frustrated with trying to draw mandalas, and having them look like a drunken monkey did them! Granted, I'm not very artistic, but I knew I could do better. So I found a way to make drawing mandalas easy, and with great results. I put this together in a package that gives you the tools and tips you need to make your mandalas look wonderful. How much more satisfying it is to create a thing of beauty! And as a journaling device, mandalas done with this Starter Kit give a more accurate awareness of your inner self. To celebrate this momentous occasion ; ) I am offering the package at a discount price. Only til the end of October, though, so come and get yours right away. Don't put it off... before you know it, it'll be November and you'll be paying a lot more for it. Did I mention that it comes with a bonus gift? The Spiritual Templates e-book is also yours with your purchase, absolutely free. See this page for more details on the spiritual templates. I hope you take advantage of this package. It lasts forever... you'll be having fun with mandalas for the rest of your life. It's a great spiritual practice, too. And of course it's 100% guaranteed. If you don't like it for any reason, you'll get your money back. It's been a long time coming, but it's worth the wait. Check it out today! It's a gift to yourself you won't want to miss. If you were at the Wise Woman Festival in Naramata, BC, this year, you may have seen me. Due to some administrative confusion, it wasn't clear whether I would be teaching there again this year or not, so unfortunately I didn't have the opportunity to let you know in advance. Both workshops were a lot of fun... as usual! It's always a great group of women at the WWFest. As well, I discovered that people are eager to learn about Wicca as a spiritual practice, as well as a religion. I was inspired to put together an online course for this purpose... keep your eyes on the blog or this e-zine to learn when it's available. It was great to watch a group of people trying out the Personal Mandala Starter Kit. We could all see from their wonderful mandalas and the ease they had in getting started that the Starter Kit really is an exceptional tool. I'd heard this, of course, but it was a treat being able to see it in action. I'm excited to offer it to you! ... once I can work out the bugs in the Paypal system. At the end of September and early October, I was again available for Palmistry and Tarot readings as well as spiritual counseling in Alberta, Canada. These are ongoing events, it seems, so if you missed them this year, put them on your calendar for 2009. I'd love to see you there! "A New Earth" -- how could this not be an excellent book for Wiccans? Aren't we all dreaming of and working for the day when the Earth is reborn? When humanity sees the Earth -- and each other -- with new eyes, with love and respect? While Eckhart Tolle doesn't elaborate on what this "New Earth" will be like, he effectively illustrates how to get there. Mabon, or Autumn Equinox, is one of the solar festivals on the Wiccan Wheel of the Year. In the Wicca calendar, this festival falls near September 21 in the Northern Hemisphere, and March 21 in the Southern Hemisphere. Equinox means "equal night." On this Wiccan Sabbat, day and night are equal forces, and now Darkness is beginning to gain the ascendancy. As with all spiritual matters, we must ask: "What does this mean, symbolically?" Putting aside old superstition and association of "dark" with "evil," what does equinox tell us? I wish to find my TRUE name. Not the one that was bestowed upon me at birth. I wish to find my identity not the one that everyone else believe is me. But I am so unsure of how to find it. I do not wish to continue down this road of life without knowing of who I am. Please write me and tell me of how to fix this small yet complicated problem. This is a very common situation. Many of the emails I've been getting these days are asking the same question. And it means more than it seems, on the surface. As you put it so well, wanting a "true name" is wanting to know who you truly are. The search for your name is a search for yourself! So of course the longing is intense, for many people. It used to be that most people who felt a need to "find themselves" were of middle age, but now people of all ages are hearing this Call. So to answer the actual question, I've given a lot of information on the website; the section starting at Finding Your Wiccan Name will get you on your way. As for the underlying question -- that of finding out Who you are -- there are no simple answers. But the very fact that you are seeking is what's important. The search will inevitably lead you to the answer. "Knock and the door shall be opened to you." As you pursue a spiritual life, keeping your eyes and heart open, you will begin to sense the truth within you. First, there must be order and harmony within your own mind. Then this order will spread to your family, then to the community, and finally to your entire kingdom. Only then can you have peace and harmony. An intense summer! Have you found it extremely emotionally overwhelming and challenging? Well, you're not alone. It's as if multiple buttons are getting pushed all at the same time. We are being challenged to see how far we can stretch, and not snap. You may have found addictive behaviour returning... even though you'd made good strides in releasing the pattern. For instance, an addiction to worrying, perfectionism, or workaholism made a comeback for many people; for others it was actual (that is, external) drug addiction. While some of us have succumbed to unwholesome patterns, others have done very well in recognizing the tendency, and choosing another path. Which group you fall into doesn't matter in the least. We're all doing the best we can. We're all facing and processing the same issues, and that's what's important. Even though we may yield to the pressure of past patterns, each time we do it with more awareness. We may be "caught" but we're not as submerged. It makes sense, I guess, that the Cauldron of the world is heating up. The challenges get more intense as the work progresses. As babies, all we needed to do was learn to hold our heads up. Then later came the more complex task of walking. Still later, we needed to learn to wield a pencil and write comprehensibly. As the Earth is progressing on its spiritual evolution, the lessons get more challenging. This doesn't mean we're "still failing." Quite the contrary! It means we ARE learning, and so we are able to assay more difficult tasks. Nonetheless, it has been a trying time. And perhaps the next season, the fallowing season, will give us respite. Or maybe we'll learn to give ourselves a break. I have noticed that for those who were able to avoid the pitfalls of their habitual behaviour, the rewards were immediate and gratifying. Things began to flow in a beautiful way, opportunities presented themselves which had been elusive for many years. This is the gift of freedom. And we are learning to claim it for ourselves. Yule Tide. . . . See you then! Thanks for writing!! I appreciate hearing from you! Finally! just what I've been looking for. Erin I love this site, I found it just when I really needed it. Lately I have been asking myself "How can I serve the evolution of humanity?" and I loved your article about spiritual evolution. It is refreshing to see someone take Wicca beyond the spells and magick. It is time for wicca to evolve too. I will be visiting this site lots more, You have so much good stuff to read. If you're reading this on the recommendation of a friend and would like to receive all the future editions, you can subscribe for free through this link: The Silver Chalice E-Zine to subscribe. © erin dragonsong 2008. All rights reserved worldwide. Reprinting any of this is forbidden unless you obtain my written permission: karma and the law agree on this one. And Copyscape is keeping an eye on these things.